In the afternoon of 10 December 2005, a Eurasian Pygmy Owl Glaucidium passerinum was observed by a single observer in a mixed forest near Bakkeveen, Friesland, the Netherlands. The bird reacted to an imitation of the call and was observed down to a few metres. It was identified by the combination of very small size (comparable with Common Starling Sturnus vulgaris), face pattern, brown upperside with white spots, pale underparts, strongly streaked brown, brown undertail with broad white bands, pale yellow bill, yellow eyes and absence of ear-tufts. The flight was undulating and, when perched, the bird made circular tail movements. The next day, a group of almost 400 birders searched in vain and this bird was not seen again. In the afternoon of 10 February 2008, two birders discovered an individual at Leenderbos near Valkenswaard, Noord-Brabant, the Netherlands. Just before dark, the bird was relocated and seen by c 40 birders. The next day, it was still present and seen by a few 100 birders. The confiding bird could be observed and photographed from short distances, near a clearing in mixed forest. It was easily identified by the combination of small size, plumage details, including ‘false eyes’ on the back of the head, and behaviour. At least twice, it caught a vole, storing it in small tree holes. On 11 February, c 15 pellets were produced and collected by birders. The bird at Bakkeveen has been accepted by the Dutch rarities committee (CDNA) as the second Eurasian Pygmy Owl for the Netherlands. The bird at Valkenswaard represents the third (if accepted). The first record concerned a bird picked up alive after colliding with a window and released at Sumarreheide, Friesland, on 4 October 2002 (only c 15 km from the site where the bird in December 2005 was seen). Because there were no apparent invasions into southern Scandinavia during these years, the records most probably relate to young birds wandering from the spreading and increasing German population. The only recent invasion in Scandinavia – with three birds reaching northern Denmark – was in autumn 2003. On 20-21 October 2006, a Pallid Swift Apus pallidus was present on Vlieland, Friesland, the Netherlands. It was seen by c 20 birders staying on the island on the first day and successfully twitched by c 60 birders on the second day, when it flew in large circles along the coast and over the sea. On the first day, it was often seen with one or two Common Swifts A apus, allowing direct comparison of shape, plumage and flight actions. It was aged as a first-year and identified on basis of tail shape (t4 and t5 of almost equal length) and the following plumage characters: 1 overall paler plumage than Common; 2 paler underwing with pale greater and median coverts (median are dark in Common); 3tail-feathers paler and browner on inner web than in Common; 4 rump, vent and undertail-coverts paler and more scaly than in Common; 5 contrastingly paler head; 6 large pale throat patch, gradually extending to ear-coverts and forehead; 7 pale bases of belly- and breast-feathers, forming pattern of crosshatching; 8 dark eye-mask being conspicuous in rather pale head; and 9 pale panel on greater and median coverts on upperwing. This is the first record for the Netherlands. Several reports in previous years were not as well photographed as this bird and, as a consequence, not accepted by the Dutch rarities committee. In dit artikel wordt ingegaan op het voorkomen en de herkenning van ‘izabelklauwieren’ in Nederland. Elk geval wordt uitgebreid beschreven en de beslissing van de CDNA wordt toegelicht. De determinaties zijn voornamelijk gebaseerd op Worfolk (2000). Vanaf het eerste geval in 1985 tot en met 2006 zijn 10 ‘izabelklauwieren‘ aanvaard. Twee betroffen Turkestaanse Klauwier Lanius phoenicuroides, zes Daurische Klauwier L isabellinus en twee zijn aanvaard als ‘izabelklauwier’ L isabellinus/phoenicuroides. Opvallend is het hoge aantal van vijf adulte vogels (vier werden als eerstejaars aanvaard en van één kon de leeftijd niet met zekerheid worden bepaald). Bij andere soorten dwaalgasten in het najaar is in de regel het percentage adulte veel kleiner of zelfs nihil. In het artikel wordt voorts een overzicht gegeven van alle bekende gevallen (157+) elders in Centraal- en West-Europa tot en met 2006 (appendix 1). Daaruit blijkt dat daar in tegenstelling tot Nederland phoenicuroides net iets vaker is vastgesteld dan isabellinus (respectievelijk 26 en 17 gevallen; alle andere (114+) zijn (nog) niet – of niet met voldoende zekerheid – tot op soortniveau aanvaard). Als de Nederlandse gevallen worden meegeteld is de verhouding 28 phoenicuroides tegen 23 isabellinus. Chinese Klauwier L arenarius is niet met zekerheid in Europa vastgesteld; er zijn wel één of twee gevallen van vogels met (enkele) kenmerken van deze soort in Italië (één ‘mogelijke arenarius’ en één ‘arenarius/isabellinus’) maar deze zijn (nog) niet als zodanig aanvaard. Bij het overzicht van Europese gevallen buiten Nederland valt eveneens het relatief hoge aantal adulte vogels op (c 44, bijna 30%). Bijna de helft van de gevallen (76) stamt uit Brittannië. Uit de maandelijkse verdeling (figuur 4) blijkt dat de beide taxa gecombineerd in alle maanden van het jaar werden waargenomen, met uitzondering van februari. De meeste werden genoteerd in het najaar met een duidelijke piek in de tweede helft van oktober. Daarnaast is er sprake van een kleine piek in het voorjaar, van eind april tot begin juni. In dit artikel wordt een overzicht gegeven van interessante vogelwaarnemingen die aanvullingen of correcties vormen op de informatie in Wassink & Oreel (2007). Ook wordt een aantal waar¬nemingen vermeld waarvan de documentatie volgens de auteurs onvoldoende is zekergesteld. Het overzicht bevat één nieuwe soort voor Kazachstan, Himalayakwikstaart Motacilla alboides. Twee soorten zijn door de auteurs van de nationale lijst afgevoerd vanwege het feit dat de documentatie niet (meer) te traceren is, Monnikskraanvogel Grus monacha en Witnekkraanvogel G vipio. 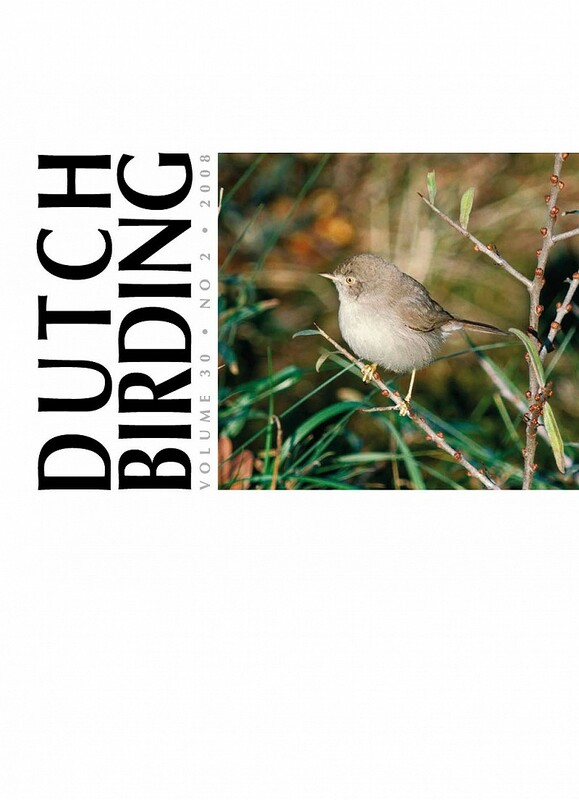 This paper describes the second five-year period of Dutch Birding and the Dutch Birding Association (DBA). In this period, many ‘new’ birders became active in the journal’s editorial team or as member of the board. The Dutch rarities committee (CDNA) was virtually transformed by a ‘new generation’ of Dutch Birding members taking over the workload. In 1987, this situation was formalized when the CDNA became a joint committee of the Netherlands Ornithologists’ Union (NOU) and DBA. A milestone in this period was the completion of the first phase of the revision of the Dutch list. This resulted in the removal of (more than) 24 species. Another milestone was the beginning of the Dutch Birding birdline in May 1987, a simple answering phone in the first years, making bird news accessible for any interested birder and not only for those connected through the ‘grapevine’. During this period, also the first colour photographs (in 1986) and the first sonagrams were published in Dutch Birding. A number of key identification papers in these years is mentioned, including several by Killian Mullarney and Hadoram Shirihai. Four Inter¬national Bird Identification Meetings greatly influenced the thinking about bird identification and resulted in agreements about terminology of plumages and moult. In 1987, journals with similar contents were founded in England (Twitching, after a year renamed as Birding World) and Germany (Limicola). Meanwhile, telescopes had become part of the average birder’s outfit. All these developments together may explain why the number of rarities gradually increased and, in 1984-88, 20 species and a few subspecies were added to the Dutch list (compared with 16 species in 1979-83). Chronologically, these were Greater Sand Plover Charadrius leschenaultii of the leschenaultii/crassirostris subspecies group, Citrine Wagtail Motacilla citreola and Spectacled Warbler Sylvia conspicillata in 1984; Bonaparte’s Gull Chroicocephalus philadelphia, Red-eyed Vireo Vireo olivaceus, ‘isabelline shrike’ Lanius isabellinus/phoenicuroides, Siberian Chiffchaff Phylloscopus collybita tristis and Ross’s Goose Anser rossii in 1985; Alpine Accentor Prunella collaris, Ring-billed Gull Larus delawarensis, Forster’s Tern Sterna forsteri, White-throated Robin Irania gutturalis and Black-faced Bunting Emberiza spodocephala in 1986; Ivory Gull Pagophila eburnea, Moltoni’s Subalpine Warbler S cantillans moltonii, Red-necked Stint Calidris ruficollis, Franklin’s Gull L pipixcan, Baltimore Oriole Icterus galbula and Olive-backed Pipit Anthus hodgsoni in 1987; and Black-headed Wagtail M feldegg, Pied Wheatear Oenanthe pleschanka, Caspian Gull L cachinnans, Northern Mockingbird Mimus polyglottos and Asian Desert Warbler S nana in 1988. Of these, Black-headed Wagtail, Spectacled Warbler, Northern Mockingbird and Baltimore Oriole have not been recorded since. Caspian Gull, on the other hand, has become so regular that, already more than 10 years ago, it was removed from the list of species considered by the CDNA. Other vagrants seen in this period which have not been twitchable since include Steppe Eagle Aquila nipalensis, Cream-coloured Courser Cursorius cursor and Eyebrowed Thrush Turdus obscurus. The organized birding week(s) on Wadden Sea islands in autumn moved from Terschelling, Friesland, to the more easily accessible island of Texel, Noord-Holland, being quite success¬ful in most though not all years. At the end of 1988, the Dutch ranking was headed by Edward van IJzendoorn and Gerard Steinhaus with 362 species, followed by Klaas Eigenhuis and Gerald Oreel (361) and Eus van den Burg and Jowi de Roever (359). The highest year totals were 281, reached by Eric Bos in 1982 and Klaas Eigenhuis in 1985.